Use for the analysis of fermented and hydrolyzed food (e.g. beer, starch syrup, starch, malt extract, sourdough, soy sauce) which are declared as “gluten-free”. The competitive enzyme immunoassay quantitates peptide fragments of prolamins from wheat (gliadins), rye (secalin) and barley (hordein). 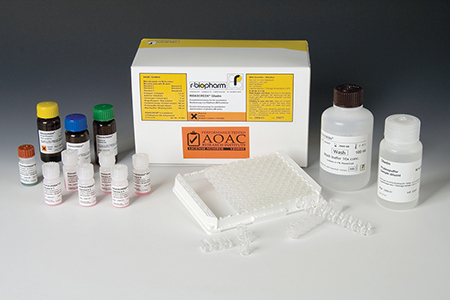 The used R5 monoclonal antibody recognizes among others the potentially toxic sequence QQPFP, which occurs repeatedly in the prolamin molecules. The official standard method for gluten determination according to the Codex Alimentarius is an ELISA which uses the R5 antibody (Mendez); this requirement is fulfilled by this test. Single, small peptide sequences (motifs) cannot be detected by a sandwich ELISA format, because at least two epitopes are necessary for a sandwich ELISA. 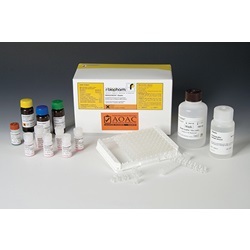 However, with a competitive format single peptide fragments can be detected. The RIDASCREEN® standard material is a hydrolysate (mixture of wheat, rye and barley). There is no cross-reaction with soy, oats, corn, rice, millet, teff, buckwheat, quinoa and amaranth.